Smaller size: 5.22 x 3.35 x 2.76" vs. 5.67 x 4.35 x 2.94"
With these two cameras having the same heart, the imaging sensor, producing similar image quality, it is especially interesting to compare these two models. If photographing action is on your to-do list, the 6D Mark II is probably better-suited for your needs and some of the other 6D II advantages are important for certain uses. The travel-friendly smaller size and lighter weight along with the wallet-friendly lower cost are going to win the RP a lot of hearts as will some of its other features including the larger, full-coverage viewfinder and 4k video. The purchase of either of these models over the other can be justified, but I expect the RP to quickly become the more popular option. Permalink: Should I Get the Canon EOS RP or the EOS 6D Mark II? Should I Get the Canon EOS R or the EOS RP? As the long-awaited Canon full frame mirrorless camera line is beginning to fill out, the first two models are worth comparing. The Canon EOS R vs. Canon EOS RP comparison using the site's specifications tool shows most of the differences between these cameras. Those and a handful of others are included below. The EOS R is a higher-end model and that shows very strongly in its list of advantages. However, the first three RP advantages are very significant ones. Those on a tight budget are going to be favoring the RP. While the EOS R is itself a relatively small and light camera, the RP easily bests it in these categories and those traveling, hiking, etc. may be willing to forgo the R's benefits to also give up some size and weight. Permalink: Should I Get the Canon EOS R or the EOS RP? Should I Get the Canon Speedlite 430EX III-RT or the Speedlite 470EX-AI Flash? For those looking to add a Speedlite flash to their photography kits and don't need the highest-end option available, the Canon 430EX III-RT and 470EX-AI are budget-priced, feature-filled mid-grade options worthy of consideration. With that in mind, we'll compare/contrast the features of the 430EX III-RT and 470EX-AI flashes to see which one might be best for your needs. Who should opt for the Canon Speedlite 430EX III-RT? If you endeavor to use (and control) multiple light setups, and want to avoid the limitations of optical (line-of-sight) triggering, the Canon 430EX III-RT will be the best choice for your needs. While the Canon 470EX-AI can act as a slave in optically-triggered setups, the Canon 430EX III-RT can act as a master or slave in radio or optically-triggered setups. The flexibility that the 430EX III-RT's wireless features afford is immense, greatly increasing the usefulness of the flash. Also, those wanting a smaller/lighter flash atop their cameras, photographers who prioritize battery life and/or recycling time or persons with a limited budget will find the 430EX III-RT to be a better flash for their needs. Who should opt for the Canon Speedlite 470EX-AI Flash? Those photographers who appreciate the convenience of a flash that automatically calculates the optimal bounce direction will find the Canon Speedlite 470EX-AI Flash's auto-rotating head to be the deciding factor. Wedding / event photographers and those new to Speedlite flash use will especially appreciate the 470EX-AI's unique auto-bounce capability, allowing for flattering subject lighting with little effort or experience required. If optical triggering is sufficient for your multiple flash setup needs, the 470EX-AI can easily be incorporated as a slave unit. Few will find the 470EX-AI's slightly higher guide number to be a deciding factor, but the flash's extra power could prove beneficial in certain situations. Canon Speedlite 430EX III-RT – B&H | Adorama | Amazon US | Canon USA / Refurb. 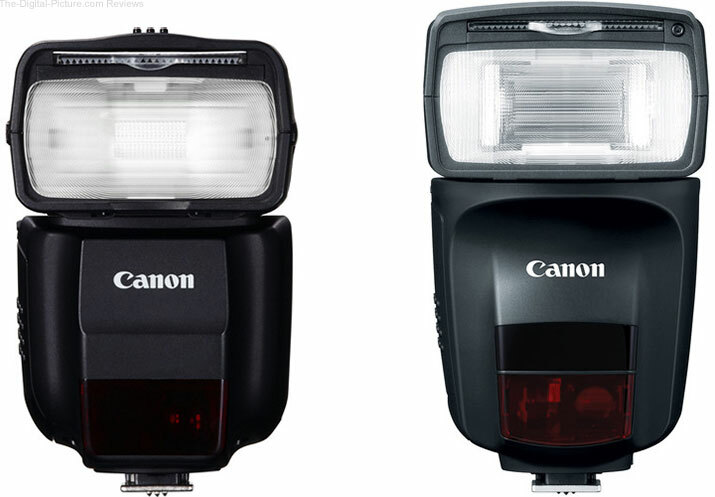 Permalink: Should I Get the Canon Speedlite 430EX III-RT or the Speedlite 470EX-AI Flash? Should I Get the Canon EOS 77D or the Canon EOS Rebel T7i / 800D? Those wanting an entry-level, yet feature rich DSLR will likely be considering the Canon EOS 77D and Canon EOS Rebel T7i / 800D. And while the two bodies appear (and, in fact, are) very similar, there are a few differences that may tip the decision-making scales in one direction or the other. 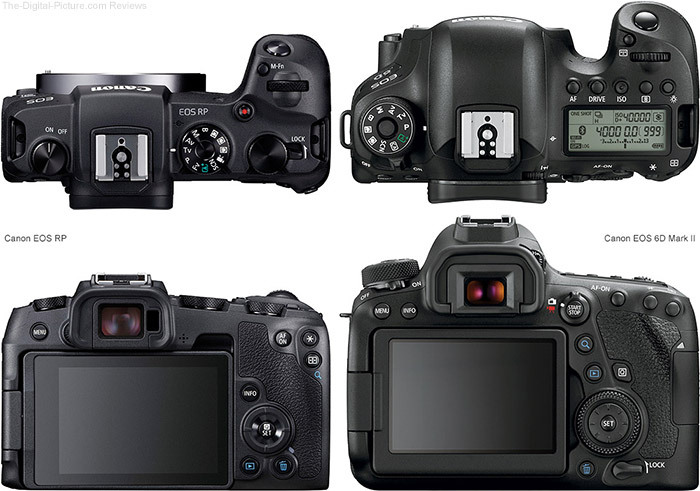 So, let's take a closer look at these DSLRs to see how they stack up against one another, beginning with their similarities. Who should opt for the Canon EOS 77D? Few camera comparisons are as simple as this one. If the features listed in the Primary Advantages of the Canon EOS 77D section are worth its incremental cost over the Canon EOS Rebel T7i, then the decision is easy – get the 77D. The top LCD panel and AF On button (enabling back-button focus) specifically are features that many photographers will find especially beneficial, making the incremental investment over the Rebel T7i a worthwhile one. Who should opt for the Canon EOS Rebel T7i? If the EOS 77D's advantages listed above are of little value to you, or your budget is limited, then the Canon EOS Rebel T7i has gives you 95% of features of the 77D but at a lower cost. Like all top-end Rebels before it, you get a lot of value for your money. Permalink: Should I Get the Canon EOS 77D or the Canon EOS Rebel T7i / 800D? Should I Get the Sony a7 III or the Canon EOS R? The EOS R represents Canon's initial foray into the mirrorless camera market and many may be wondering how it stacks up against Sony's feature-packed, budget-priced a7 III. If you fall into that group, read on as we compare these two cameras. Who should opt for the Sony a7 III? If you're looking to upgrade to a full frame camera and don't already have a large collection of Canon lenses, or otherwise want to get more serious about photography and prefer to skip on an APS-C sensor body, the Sony a7 III has a lot to offer, including a very reasonable price tag. Sony's IBIS (In-Body Image Stabilization) technology enables up to 5-stops of camera shake compensation with any lens that's mounted to the camera and represents huge advantage for the a7 III. Those shooting static subjects in low-light situations or when using a narrow aperture to obtain a desired depth of field, especially when a non-stabilized lens is mounted to the camera, will greatly appreciate the a7 III's sensor stabilization. Are you a wedding photographer? The a7 III's dual memory card slots can protect once-in-a-lifetime images from being lost due to a corrupted memory card, and the camera's higher dynamic range could come in handy for events needing great exposure latitude. Another a7 III features that wedding/event/festival photographers will surely appreciate include is its significantly longer battery life compared to the EOS R.
Fast action shooters will be able to capture a higher percentage of peak-action shots with the a7 III's 10 fps burst rate with AF tracking compared to the EOS R's 5 fps under the same circumstances, while the camera's eye tracking AF will ensure that the subject remains properly focused. Note: The a7 III's continuous burst rate drops to 8 fps with viewfinder Live View (for easier subject tracking) in use. Videographers who want to shoot slow motion video can utilize the a7 III's 120 fps Full HD frame rate to capture smooth, slow motion video with sound and AF tracking. The EOS R's resolution at 120 fps tops out at 720p and sound recording/AF tracking is not supported. Want to get the most out of your high quality, wide angle lenses when shooting in 4K? The a7 III samples the entire width of the full frame sensor when shooting in 4K, meaning your wide angle lenses produce an uncropped field of view, perfect for capturing expansive views. Recording in 4K on the EOS R, on the other hand, results in a 1.75x crop factor for your lenses. That means that a 16-35mm lens mounted to the EOS R produces a full frame equivalent field of view of 28-61.25mm in 4K mode. Who should opt for the Canon EOS R? If you're highly invested in the Canon EOS system but want to give mirrorless a try, getting the Canon EOS R will allow you to gradually build up a mirrorless kit, taking full advantage of the new RF lenses coming down the pipeline, while being able to fully utilize your existing DSLR lenses in the meantime. Speaking of lenses, at this time, Sony has 43 FE lenses that can natively fit on the Sony a7 III. Of those, 25 cover the entire full-frame sensor. Other lenses (such as Canon EF) can be used on Sony cameras via adapters, but adapted lenses don't perform nearly as well as their native counterparts on Sony alpha-series cameras. However, while the currently announced pool of Canon RF lenses is small by comparison, Canon's EF-EOS R adapters allow nearly full functionality with EF/EF-S/TS-E and MP-E lenses (EF-S lens use results in a cropped recorded image). With Canon EF-series lenses performing similarly to RF lenses on the EOS R, the pool of lenses available for EOS R customers considerably increases. In fact, if you add up all the different EF/EF-S/TS-E and MP-E lenses which have been produced since the EF mount was introduced and add the announced RF lenses, you'd have more than 175 lenses to choose from, 149 of which cover the entire full frame sensor. From an ergonomics perspective, the EOS R features a deeper grip and raised buttons that are easier to find without having to look at the body. The new Multi-Function Bar may take some getting used to (some may not like it), but many photographers will find the Control Ring found on the new RF lenses helpful for changing a preferred setting. For those used to glancing at a top LCD to check camera settings, the EOS R has you covered. Landscape photographers can enjoy the benefits of the Canon Drop-in Filter Mount Adapter EF-EOS R with their EOS R to enable a circular polarizer or variable ND filter to be used with any of their EF-series lenses. With most ultra-wide angle lenses being incompatible with front filters, the Drop-In Filter Mount Adapter will prove to be a vital component of many landscape shooters' kits. If you're a portrait shooter, you'll likely prefer the EOS R's faster AF performance in One-Shot mode compared to the Sony a7 III which defocuses/refocuses with every shot even if your subject hasn't moved. Those shooting portraits will also enjoy the bokeh-accentuating, shallow DOF (Depth of Field) capabilities that Canon's RF and EF mounts offer, including lenses featuring extremely wide f/1.2 apertures. Vloggers and those shooting self-portraits will find the EOS R's vari-angle LCD much better for self-framing compared to the a7 III's tilt-screen. * Canon claims a future firmware update will enable Eye AF with AI Servo mode. The Canon EOS R and Sony a7 III are both incredible cameras at good-value prices and either can be a great option for most needs. Permalink: Should I Get the Sony a7 III or the Canon EOS R? Should I Get the Sony FE 16-35mm f/2.8 GM or Sony FE 16-35mm f/4 ZA OSS? Landscapes, weddings, architecture, real estate, photojournalism – all are great reasons to have a wide angle zoom in your kit. Now the big question becomes, "Which one?" For Sony shooters, the FE 16-35mm f/2.8 GM and FE 16-35mm f/4 ZA OSS will likely be at the top of the wide angle zoom considerations list. Before we dig deeper into this comparison, regular site visitors may notice that text below sounds a lot like our Sony FE 24-70mm f/2.8 GM vs. Sony FE 24-70mm f/4 ZA OSS Lens comparison. Well, there's a good reason for that – the 16-35mm lenses listed above share many of the same benefits and drawbacks as their 24-70mm counterparts when compared against one another. 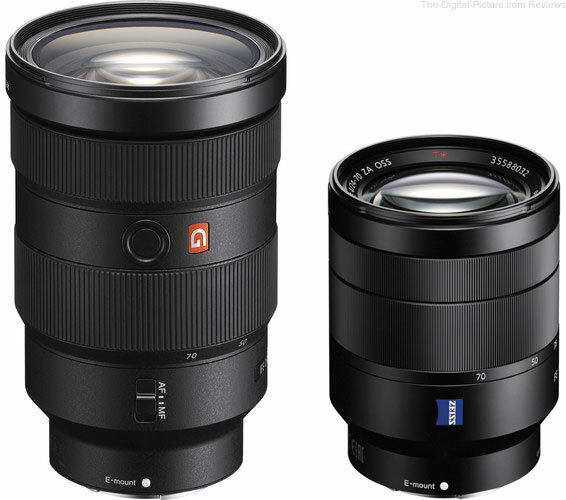 Therefore, much of the content of the 24-70mm comparison applies equally to the Sony FE 16-35mm f/2.8 GM and Sony FE 16-35mm f/4 ZA OSS lenses. So, without further ado, let's take a look at these two 16-35mm lenses to see which one proves to be the best investment for your needs. The FE 16-35mm f/2.8 GM lens is slightly sharper in the center at 16mm and 20mm f/4 and the FE 16-35mm f/4 ZA OSS lens is slightly sharper in the corners. The f/2.8 lens center of the frame advantage grows slightly at 24mm and more than slightly at 28mm. At 35mm f/4, the f/2.8 lens turns in a far better performance. These differences are minimalized at f/5.6, but the f/2.8 remains a much better choice at 35mm. As one would expect, the f/2.8 lens shows less vignetting at f/4. By f/8, the differences are minor. The f/2.8 lens has more barrel distortion at 16mm, but less pincushion distortion in some of the mid focal length comparisons. Who should opt for the Sony FE 16-35mm f/2.8 GM? There are many drawbacks to an f/2.8 constant max aperture lens compared to an f/4 constant max aperture lens, including increased size, weight and cost. However, the Sony FE 16-35mm f/2.8 GM's twice-as-wide max aperture will allow you to freeze motion in half as much light at the same ISO setting compared to the FE 16-35mm f/4 ZA OSS. If you're a wedding/event photographer, or prefer not to pack a tripod for nighttime cityscape/street photography adventures, the increased size/weight/cost associated with the f/2.8 lens will prove more than worthwhile. Who should opt for the Sony FE 16-35mm f/4 ZA OSS? If you don't often need to capture moving subjects in low-light situations, and can tolerate higher ISO use when the need arises, then the Sony FE 16-35mm f/4 ZA OSS offers many of the benefits of the Sony FE 16-35mm f/2.8 GM at less than half the price. For static subjects, when combined with Sony alpha-series cameras' IBIS (In-Body Image Stabilization), the Sony FE 16-35mm f/4 ZA's Optical SteadyShot should provide even more effective stabilization compared to a lens without built-in IS. As you can see by the product pictures and specs listed above, the size and weight differences between these lenses are not insignificant. Photographers who will benefit from the FE 16-35mm f/4 ZA OSS's smaller size/lighter weight include anyone carrying their gear for long periods of time (for backpacking, vacations, long events, etc.) and those wanting to pack more gear in a similar amount of space. With many full frame Sony a-series cameras having built-in sensor stabilization, one of the Sony FE 16-35mm f/4 ZA OSS Lens's major benefits – optical stabilization – is diminished. However, it does have a few advantages remaining over the Sony FE 16-35mm f/2.8 GM that will make it desirable for many photographers – smaller size, lighter weight and a much lower cost. In addition to the 1-stop wider max aperture, most photographers will prefer the FE 16-35mm f/2.8 GM's image quality over the f/4 lens. For those photographing moving subjects and/or utilizing the entire focal length range on a regular basis, such as wedding/event photographers, will find the Sony FE 16-35mm f/2.8 GM to be a worthy investment. 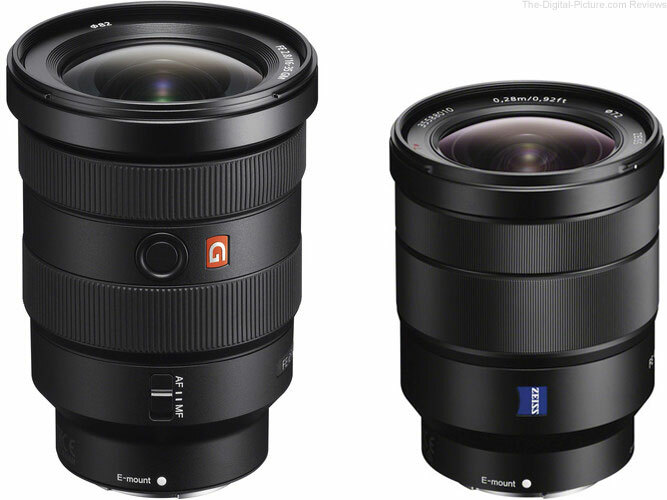 Otherwise, the Sony FE 16-35mm f/4 ZA OSS is available for significantly less. Permalink: Should I Get the Sony FE 16-35mm f/2.8 GM or Sony FE 16-35mm f/4 ZA OSS? Should I Get the Sony FE 24-70mm f/2.8 GM or Sony FE 24-70mm f/4 ZA OSS Lens? A general purpose lens is the most important and most-used lens in most photographers' kits. With a highly useful focal length range and a wide to moderately wide aperture, 24-70mm lenses can cover everyday needs, portraits, landscapes, cityscapes, food/travel and much more. Sony has two high-performing, 24-70mm constant max aperture zooms in its lineup – the FE 24-70mm f/2.8 GM and FE 24-70mm f/4 ZA OSS – and we're going to take a closer look at them to see which may be better suited to fill your general purpose needs. From a sharpness perspective, the "sharpest lens" title will depend on the specific aperture/focal length being compared. There isn't really a clear winner when the entire range of tests is taken into consideration. The FE 24-70mm f/2.8 GM shows slightly less vignetting at 24 & 70mm (vignetting is similar at the middle focal lengths) when the lenses are compared at their widest apertures. When compared at f/4, the f/2.8 lens shows significantly less vignetting. The f/2.8 lens has less severe distortion over the zoom range (the difference is most noticeable at the lenses' widest and longest focal lengths), but most will prefer the f/4 lens' flare performance. Who should opt for the Sony FE 24-70mm f/2.8 GM? There are many drawbacks to an f/2.8 constant max aperture lens compared to an f/4 constant max aperture lens, including increased size, weight and cost. However, the Sony FE 24-70mm f/2.8 GM's twice-as-wide max aperture will allow you to freeze motion in half as much light at the same ISO setting compared to the FE 24-70mm f/4 ZA OSS. If you're a wedding/event photographer, or prefer not to pack a tripod for nighttime cityscape/street photography adventures, the increased size/weight/cost associated with the f/2.8 lens will prove more than worthwhile. Portrait photographers will also appreciate the better subject-to-background separation provided by the 1-stop wider aperture and the smoother bokeh/better starbursts created by its 9 bladed aperture (vs. 7). Who should opt for the Sony FE 24-70mm f/4 ZA OSS? If you don't often need to capture moving subjects in low-light situations, and can tolerate higher ISO use when the need arises, then the Sony FE 24-70mm f/4 ZA OSS offers many of the benefits of the Sony FE 24-70mm f/2.8 GM at less than half the price. For static subjects, when combined with Sony alpha-series cameras' IBIS (In-Body Image Stabilization), the Sony FE 24-70mm f/4 ZA's Optical SteadyShot should provide even more effective stabilization compared to a lens without built-in IS. As you can see by the product pictures and specs listed above, the size and weight differences between these two lenses are substantial. Photographers who will benefit from the FE 24-70mm f/4 ZA OSS's smaller size/lighter weight include anyone carrying their gear for long periods of time (for backpacking, vacations, long events, etc.) and those wanting to pack more gear in a similar amount of space. With many full frame Sony a-series cameras having built-in sensor stabilization, one of the Sony FE 24-70mm f/4 ZA OSS Lens's major benefits – optical stabilization – is diminished. However, it does have a few advantages remaining over the Sony FE 24-70mm f/2.8 GM that aid in boosting the f/4 lens' popularity – smaller size, lighter weight and a much lower cost. If any of those features is a priority for you, then the Sony FE 24-70mm f/4 ZA OSS is the lens to get. Otherwise, a 24-70mm f/2.8 zoom has been a must-have lens for a wide variety of professional photographers over the years, and for those choosing Sony gear, the FE 24-70mm f/2.8 GM is one of the first lenses they'll be adding to their kits. Permalink: Should I Get the Sony FE 24-70mm f/2.8 GM or Sony FE 24-70mm f/4 ZA OSS Lens? Should I Get the Canon EOS R or the Canon EOS 6D Mark II? With the announcement of the EOS R, many may be wondering if diving into Canon's mirrorless system is the right step forward in regards to their next camera upgrade or if the Canon EOS 6D Mark II will fill their needs just fine. Therefore, we're going to take a closer look at these two cameras to see which might be the better choice for your needs. 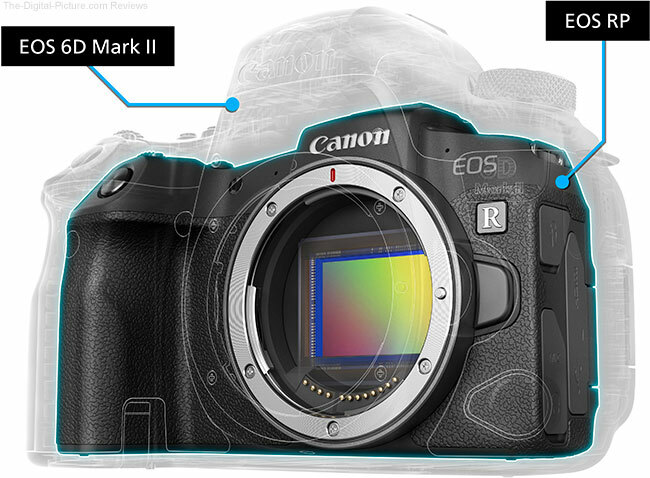 If you read our Canon EOS R vs. Canon EOS 5D Mark IV comparison, you'll recognize a lot of the benefits listed below. The reason is simple – many of the EOS R's benefits are unique to Canon's new mirrorless system, especially in regards to the R's use with adapted lenses, and those benefits remain the same when the camera is stacked up against any Canon DSLR. The EOS R features an RF mount. Upon the camera's release, the selection of RF lenses will be relatively small (only four have been announced). While that may seem limiting, the truth is that the EOS R with its RF mount will be even more versatile than the EF-mount 6D mark II if adapted lenses are taken into consideration. With the Canon Mount Adapter EF-EOS R, Control Ring Mount Adapter and Drop-In Filter Mount Adapter, the EOS R is compatible with EF/TS-E/MP-E and – in a first for Canon full-frame cameras – EF-S lenses as well. So while the selection of RF lenses may be limited for the time being, the unique capabilities afforded by Canon's mount adapters will make the EOS R very attractive for several types of photographers. Which photographers, precisely? Landscape photographers, portrait photographers and videographers will especially appreciate the benefits of the Drop-In Mount Adapter. How often do landscape photographers want to use CPOLs (circular polarizers) or ND (neutral density) filters with wide angle or ultra-wide angle lenses that are incompatible with front filters? Up until now, using filters with such lenses required the use of cumbersome 3rd-party front filter adapters. With the EOS R, those photographing the great outdoors can enjoy the benefits of a lighter camera body as well as a universal CPOL/vari-ND filter solution for their existing lens collection when traveling to their favorite sunrise location. Landscape photographers often want to stack a circular polarizer with an ND filter on a wide angle lens featuring front filter threads, but the resulting mechanical vignetting (and the increased likelihood of stuck filters) makes using the combo impractical. The Drop-In Filter Mount Adapter with Variable ND filter –with 1.5 - 9 stops of density – can easily be paired with a front-mounted circular polarizer like the B+W XS-Pro CPOL. A B+W XS-Pro CPOL will allow landscape photographers to cut through glare to capture dark blue skies and saturated foliage yet is thin enough not to cause mechanical vignetting on most wide angle lenses. And with a rear-mounted variable ND, a photographer can simultaneously reap the benefits of a long shutter speed to capture the movement of flowing water, clouds, rustling trees, etc. The EOS R will be the better option to capture recitals, dance and theater performances with its absolutely silent shooting mode. Those shooting portraiture will certainly appreciate the EOS R's Eye Detection AF, especially when a wide aperture prime lens is being used either natively or with an adapter. The EOS R's AF system is able to lock focus on and track subjects over a significantly larger portion of the frame compared to the 6D II's 45-point phase-detect AF system, allowing for greater flexibility in subject framing without having to focus and recompose. And because the EOS R utilizes the sensor for focusing, calibration issues associated with traditional phase-detect AF systems can be avoided altogether, better ensuring focus accuracy. If a photographer's off-camera flashes are not capable of high-speed sync, the Drop-In Filter Mount Adapter with Variable ND can enable use of a shutter speed below the camera's x-sync speed (for the R, 1/200 sec.) while using flash and a wide aperture for great subject/background separation. The EOS R can record video at 4K resolution while the 6D Mark II tops out at 1080p. Videographers can either use the extra resoltion to create highly detailed movies or otherwise create stabilized 1080p video and/or create panning movements within the 4K frame. Videographers can also make use of the Drop-In Filter Mount Adapter, especially when used with the variable ND to record video at optimal shutter speeds (typically, 2x the frame rate). With filters attached to the back of lenses, lens changes can occur more quickly (no need to unscrew/mount a separate ND filter) and the variable ND could easily replace numerous traditional ND filters in a filmmaker's kit. Who should opt for the Canon EOS 6D Mark II? There are benefits and drawbacks to Electronic Viewfinders (EVFs) and Optical Viewfinders (OVFs); neither will be best for/preferred by everyone. The 6D Mark II's viewfinder blackout time is actually shorter than the EOS R's viewfinder stutter during capture, making tracking laterally moving or erratic subjects easier with the OVF. If an optical viewfinder is preferred for any reason, the 6D II is, of course, the obvious choice. Other than that, the primary reasons to get a 6D Mark II are battery performance, preference for unadapted lenses and price. The EOS 6D Mark II's is rated for significantly more shots per battery charge compared to the EOS R. If you're often forgetting to charge and/or pack extra batteries, the 6D II may be the better camera for you. Those who simply don't like using adapters will also be better served by the 6D II. And finally, those whose budgets do not extend to the EOS R, especially when the cost of adapters are considered, may take advantage of the 6D II's slightly lower price tag (instant rebates may augment that difference from time to time). The EOS R's ability to use adapted lenses, and the unique capabilities provided by the adapters, makes Canon's full-frame mirrorless introduction a camera you can effectively use now and well into the future, taking full advantage of all the new RF lenses headed down the pipeline. If compared to DSLRs, the EOS R's features position it somewhere between the 5D Mark IV and 6D Mark II, but certainly closer to the former than the latter. Without instant rebates in place, the price difference between the EOS R and 6D Mark II isn't all that much, even with a Mount Adapter EF-EOS R thrown into the mix. Therefore, most will find the EOS R's benefits to be well worth its incremental cost over the 6D Mark II's MSRP. Permalink: Should I Get the Canon EOS R or the Canon EOS 6D Mark II? Should I Get the Canon EOS R or the Canon EOS 5D Mark IV? With the announcement of the EOS R, many may be wondering if diving into Canon's new mirrorless system is the right step forward in regards to their next camera upgrade or if the Canon EOS 5D Mark IV is the better choice. Therefore, we're going to take a closer look at these two cameras to see which might be the better choice for your needs. The EOS R is the first Canon camera to feature an RF [mirrorless] mount. And upon the camera's release, the selection of RF lenses will be relatively small (four, to be exact). While that may seem limiting, the truth is that the EOS R with its RF mount will be even more versatile than the 5D Mark IV with the tried-and-true EF mount if adapted lenses are taken into consideration. With the Canon Mount Adapter EF-EOS R, Control Ring Mount Adapter and Drop-In Filter Mount Adapter, the EOS R is compatible with EF/TS-E/MP-E and – in a first for Canon full-frame cameras – EF-S lenses as well. So while the selection of RF lenses may be limited for the time being, the unique capabilities afforded by Canon's mount adapters will make the EOS R very attractive for a lot of photographers. Those shooting portraiture will certainly appreciate the EOS R's Eye Detection AF, especially when a wide aperture prime lens is being used either natively or with an adapter. Note that because the EOS R utilizes the sensor for focusing, calibration issues associated with traditional phase-detect AF systems can be avoided, better ensuring focus accuracy. Also, if a photographer's off-camera flashes are not capable of high-speed sync, the Drop-In Filter Mount Adapter with Variable ND can enable use of a shutter speed below the camera's x-sync speed (for the R, 1/200 sec.) while using flash and a wide aperture for great subject/background separation. Videographers will likely make use of the Drop-In Filter Mount Adapter, especially when used with the variable ND to record video at optimal shutter speeds (typically, 2x the frame rate). With filters attached to the back of lenses, lens changes can occur more quickly (no need to unscrew/mount a separate ND filter) and the variable ND could easily replace numerous traditional ND filters in a filmmaker's kit. Both the EOS R and 5D Mark IV sample the center of the sensor for 4K recording which results in a crop factor of 1.75x. However, the EOS R is compatible with EF-S lenses (the 5D Mark IV is not), meaning wide-angle framing does not have to be sacrificed. For those on a limited budget, an EOS R costs significantly less than an EOS 5D Mark IV, even if you add the cost of an EF-EOS R adapter. Who should opt for the Canon EOS 5D Mark IV? The EOS 5D Mark IV has at least one very significant benefit over the EOS R – dual memory card slots. While the EOS R and RF 50mm f/1.2L and RF 28-70mm f/2L USM would seem to be an extremely good kit for wedding coverage, the R's single memory card slot means that a card failure could prove absolutely disastrous. For that reason alone, the 5D Mark IV will be a better option for recording once-in-a-lifetime moments. Sports photographers will certainly appreciate the 5D IV's faster continuous burst rate with autofocus tracking for capturing the peak of action, although the R does have a significant edge in the RAW buffer department allowing for longer shooting at its rated speed. There are benefits and drawbacks to Electronic Viewfinders (EVFs) and Optical Viewfinders (OVFs); neither will be best for/preferred by everyone. If an optical viewfinder is preferred, the EOS 5D Mark IV is, of course, the obvious choice. While the EOS R's battery life is proving to be better in real-world shooting than its official specification would indicate, those shooting long events or in situations where battery changes aren't practical (such as heavy rain) may prefer the 5D Mark IV's higher expected battery life. Some photographers will appreciate the 5D Mark IV's built-in NFC and GPS features while others won't blink an eye at the EOS R's lack of them. Those using super telephoto lenses may also prefer the 5D Mark IV's larger size and increased weight to better balance out the camera/lens combination. The 5D Mark IV also benefits from the refinements and reliability found in a mature product line, resulting in a very user-friendly, familiar interface that can be depended upon to work in even challenging conditions. Being Canon's first professional-grade full-frame mirrorless camera, with never before seen features (like the Mult-Function Bar), may take some getting used to and will ultimately have to prove its worthiness of the "refined camera" label. The Canon EOS R and EOS 5D Mark IV were designed to be jack-of-all-trades and can be used effectively to capture... just about anything. The EOS R's ability to use adapted lenses, and the unique capabilities provided by the adapters, makes Canon's full-frame mirrorless introduction a camera you can effectively use now and well into the future, taking full advantage of all the new RF lenses headed down the pipeline. However, its lack of dual memory card slots (along with a few other differences) mean that the EOS 5D Mark IV will remain the better option for a sizeable number of photography professionals. Permalink: Should I Get the Canon EOS R or the Canon EOS 5D Mark IV? Should I Get the Canon EF 70-200mm f/4L IS II USM or Tamron 70-210mm f/4 Di VC USD Lens? A 70-200mm telephoto zoom lens is an extremely versatile tool. So veratile, in fact, it's often a pro photographer's most-used lens (or maybe just behind their general purpose zoom). Engagements, weddings, parties, events, theater, stage performances, high school senior, fashion, documentary, lifestyle, zoo, product and landscape photography are all great uses for this focal length range. If you're looking to add a 70-200(ish) mm zoom lens to your kit, and don't need an f/2.8 max aperture and/or don't want the size/weight/cost penalties tied to the wider aperture, then the Canon EF 70-200mm f/4L IS II USM and Tamron 70-210mm f/4 Di VC USD Lens are likely at the top of your considerations list. Both lenses feature an f/4 max aperture that can be stopped down to f/32, nine rounded aperture blades and built-in stabilization. Where the two lenses differ, of course, will determine which one is the better candidate for your kit. 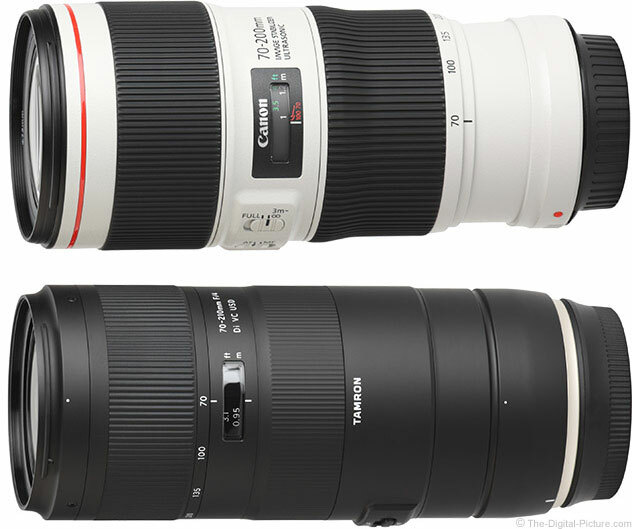 Who should opt for the Canon EF 70-200mm f/4L IS II USM Lens? From an image quality perspective, most photographers will appreciate the sharpness of the Canon EF 70-200mm f/4L IS II USM's images compared to the better distortion and vignetting performance of the Tamron. If you're shooting in situations where you can't afford to miss focus, the Canon's better autofocus performance (both in accuracy and consistency) will more than offset the lens' higher acquisition cost, especially in low light situations. And in regards to low light situations, the Canon's 1-stop higher rated stabilization system will help you get sharper images of non-moving subjects under the same shooting conditions. For those that will typically utilize the lens at its longest focal length, the Canon's better image quality at 200mm will certainly be appreciated. If intending on having your 70-200mm lens mounted for long periods of time, the Canon's rearward positioned zoom ring will certainly be more comfortable to use. And finally, if you currently only have Canon-made zoom lenses in your kit, acclimating to Tamron's reversed rotating zoom and focus rings can be maddening, especially when a fleeting shot opportunity requires a fast reaction speed. Who should opt for the Tamron 70-210mm f/4 Di VC USD Lens? If your budget does not extend to the Canon equivalent, the Tamron 70-210mm f/4 Di VC USD Lens offers many of the same benefits at at less than two-thirds the cost (without rebates). For those who plan on using their medium telephoto zoom primarily for static portraiture, especially when a focus-and-recompose technique can be employed while using the enter AF point, the Tamron's AF performance should be more than sufficient for the task. Do you own an EOS Rebel-series camera body without the ability to fine-tune AF parameters via Autofocus Microadjustment? The Tamron may prove to be the safest choice as you can compensate for autofocus miscalibration issues via the optional TAP-in Console; if you experienced a similar issue with the Canon lens, you'd need to send your camera and lens to Canon's Service Department for calibration, a much less convenient solution to the problem. Note about focal length range difference: The extra 10mm of focal length range provided by the Tamron will not be terribly significant from a practical standpoint. For instance, the difference in framing the an identical target at 200mm with the Canon and 210mm with the Tamron amounted to slightly more than 1' (305mm), meaning you could get the same basic framing with the Canon lens by leaning forward. As you can see, from a specifications standpoint, these lenses are very similar. If your budget extends to the Canon EF 70-200mm f/4L IS II USM, and you'll be using it with a body that features Autofocus Microadjustment, we highly recommend adding the L-series lens to your kit because of its sharpness, IS/AF and balance advantages over the Tamron. However, if your budget is more limited, the Tamron 70-210mm f/4 Di VC USD is an excellent value when its versatility and overall performance are considered. Permalink: Should I Get the Canon EF 70-200mm f/4L IS II USM or Tamron 70-210mm f/4 Di VC USD Lens? Should I Get the Sony a7R III or the Sony a7 III? 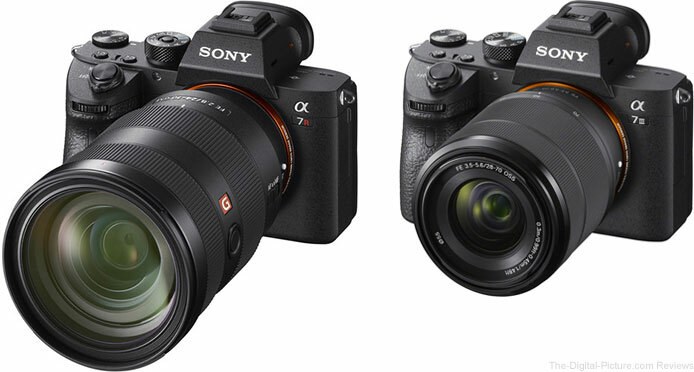 Considering the significant price gap between them, it's reasonable for anyone interested in Sony's mirrorless camera system to wonder, "Should I get the a7R III or the a7 III?" With that mind, we're going to take a closer look at these two camera bodies to see which might be the best choice for your needs. Max Shutter Speed: 1/8000 sec. Who should opt for the Sony a7R III? With such a huge list of shared features between the two cameras, the a7R III advantages list is unsurprsingly short. While many will appreciate the a7R III's higher resolution viewfinder and LCD panel, undoubtedly the most important difference between the two cameras is sensor resolution. The difference between 42.4 and 24.2 MP is substantial. If you're shooting subjects where resolving small details is a primary concern, or otherwise want the ability to heavily crop photos for better framing (or to extend the reach of a not-long-enough telephoto lens), then Sony a7R III's higher resolution sensor will be worth the incremental investment over the a7 III. If you've been on the fence about investing in a Sony mirrorless camera and you don't need the massive resolution of the a7R III or the blazingly fast frame rate of the a9, then the Sony a7 III has your name on it. It may be positioned in the lineup as Sony's entry-level full-frame camera, but the only indication of the a7 III's entry-level status is its price tag. The a7 III's comprehensive assortment of advanced features will make it right at home in many pro, advanced hobbyist or weekend warror kits as a primary or backup camera. For what you get, the Sony a7 III is a bargain. Permalink: Should I Get the Sony a7R III or the Sony a7 III? Should I Get the EOS Rebel T7i/800D or the EOS M50? For those shopping for their first non-smartphone camera, a backup camera for a current kit or simply upgrading from a lower level/previous generation Rebel-series camera, the Canon EOS Rebel T7i/800D and EOS M50 are likely to be considered. Today, we're going to look closely at these two cameras to see which might be the better option for addition to your kit. Shutter Speed: 30 - 1/4000 sec. If you are a current Rebel-series owner but want the benefits of a Dual Pixel CMOS sensor, and the size and weight of your current kit is a non-issue, then the EOS Rebel T7i/800D will offer a seamless transition with no adapters required to use your current set of lenses and a familiar button/control layout that feels right at home in your hands. With no adapter required for use with EF, EF-S, TS-E & MP-E lenses, there's one less vital piece of gear to be forgotten or malfunction. Just remember your fully charged battery and a memory card, throw your lenses in a bag and you're good to go (although we do recommend packing other items as well). 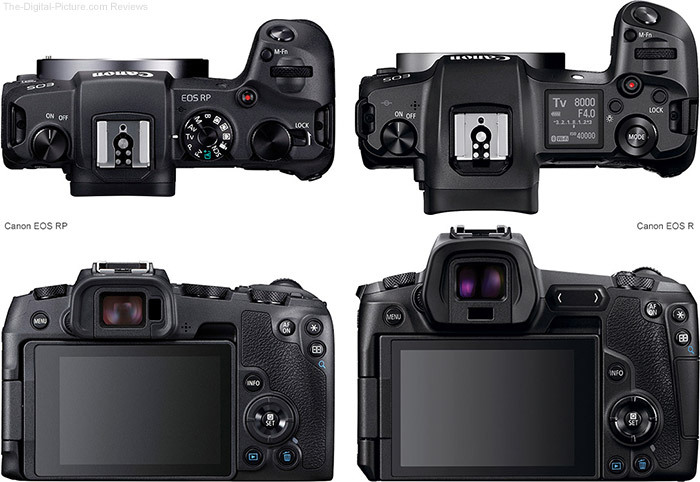 Note that the T7i has an optical viewfinder (OVF) while the EOS M5 has an electronic viewfinder (EVF), and both show up as advantages for their respective cameras. Depending on what you're shooting and what your preferences are, either one may be more beneficial than the other. Check out our OVF vs. EVF comparison here. If you're interested in exploring off-camera lighting, the Rebel T7i offers an integrated Speedlite transmitter that will allow you to control off-camera Canon Speedlites remotely. To get the same functionality with the EOS M50, you would need a master flash (600EX II-RT / 430EX III-RT) or ST-E3-RT / ST-E2 transmitter, reducing the mirrorless camera's size/weight benefits. The Rebel T7i's more sensitive AF system is able to lock on in lower light, and its battery will keep you shooting long after the EOS M50's battery has been exhausted. Who should opt for the Canon EOS M50? The EOS M50 represents a huge step up in image quality for those coming directly from a smartphone, and its size and weight will provide an easier transition into ILC (Interchangeable Lens Camera) photography compared to a traditional DSLR body. The EOS M50 will also be a great choice for current Canon DSLR owners who want a compact option that can also serve as a backup camera in a pinch (with the adapter) or otherwise want a reduced load for vacations, hiking or business trips, especially when one of Canon's EF-M series lenses will fit the bill perfectly. Want to capture 4K video? The M50 has you covered (albeit without the benefits of Dual Pixel CMOS AF). If 1080p output is your goal, you can easily downsample 4K video (with very slight cropping on the right and left sides), crop the frame to provide a tighter angle of view, or even pan your FHD video within the confines of the 4K captured frame. You can also mimic zooming in and out of a scene to add even more production value to your 1080p movies. When not utilizing 4K capture, the M50 offers similar benefits as the Rebel T7i, including DPAF subject tracking. On top of the size and weight advantages of an M-series kit, the M50's faster burst rate in single shot mode can help you capture the peak action as long as AF tracking is not needed for the specific situation. And if you prefer the benefits of an EVF (Electronic Viewfinder), then the M5 becomes the easy choice. While the EOS M50 is a moderately capable camera with the size and weight benefits a mirrorless system brings, Canon's current [limited] EF-M lens selection may not provide all the flexibility desired in an ILC kit. And while Canon's complete EF/EF-S/TS-E/MP-E lenses can be used with an adapter, using lenses designed for DSLRs on a mirrorless camera negates much of its most alluring quality, its reduced size and weight. On the other hand, the EOS Rebel T7i/800D, with its native ability to mount Canon's full range of EF, EF-S, TS-E and MP-E lenses, along with its higher battery life and built-in Speedlite transmitter, represents a simpler and more versatile platform on which to build a photography kit. For those general purpose photography situations where a single, variable aperture zoom lens will suffice, the EOS M50 paired with an EF-M zoom lens can be a very convient option that will not be a burden to carry throughout the day. Note that as Canon releases more EF-M lenses, the versatility of an M-series kit increases along with the M50's appeal. Permalink: Should I Get the EOS Rebel T7i/800D or the EOS M50? Should I Get the Canon EOS Rebel T7i/800D or the EOS M5? For those shopping for their first non-smartphone camera, a backup camera for a current kit or simply upgrading from a lower level/previous generation Rebel-series camera, the Canon EOS Rebel T7i/800D and EOS M5 are likely to be considered. Today, we're going to look closely at these two cameras to see which might be the better option for acquisition. If you are a current Rebel-series owner but simply long for the benefits of a Dual Pixel CMOS sensor, and the size and weight of your current kit is a non-issue, then the EOS Rebel T7i/800D will offer a seamless transition with no adapters required to use your current set of lenses and a familiar button/control layout that feels right at home in your hands. With no adapter required, there's one less vital piece of gear to be forgotten or malfunction. Just remember your fully charged battery and a memory card, throw your lenses in a bag and you're good to go (although we do recommend packing other items as well). If you're interested in exploring off-camera lighting, the Rebel T7i offers an integrated Speedlite transmitter that will allow you to control off-camera Canon Speedlites remotely. The Rebel T7i's more sensitive AF system is able to lock on in lower light, and its battery will keep you shooting long after the EOS M5's battery has been exhausted. And if you're on a tight budget, the Rebel T7's lower price tag will make it an even more attractive option. Who should opt for the Canon EOS M5? The EOS M5 represents a huge step up in image quality for those coming directly from a smartphone, and its size and weight will provide an easier transition into ILC (Interchangeable Lens Camera) photography compared to a traditional DSLR body. The EOS M5 will also be a great choice for current Canon DSLR owners who want a compact option that can also serve as a backup camera in a pinch (with the adapter) or otherwise want a reduced load for vacations, hiking or business trips, especially when one of Canon's EF-M series lenses will fit the bill perfectly..
On top of the size and weight advantages of an M-series kit, the M5's faster burst rate in single shot mode can help you capture the peak action as long as AF tracking is not needed for the specific situation. And if you prefer the benefits of an EVF (Electronic Viewfinder), then the M5 becomes the easy choice. While the EOS M5 is a very capable camera with the size and weight benefits a mirrorless system brings, Canon's current [limited] EF-M lens selection may not provide all the flexibility desired in an ILC kit. And while Canon's complete EF/EF-S/TS-E/MP-E lenses can be used with an adapter, using lenses designed for DSLRs on a mirrorless camera negates much of its most alluring quality, its reduced size and weight. For those general purpose photography situations where a single, variable aperture zoom lens will suffice, the EOS M5 paired with an EF-M zoom lens can be a very convient option that will not be a burden to carry throughout the day. Note that as Canon releases more EF-M lenses, the versatility of an M-series kit increases along with the M5's appeal. Permalink: Should I Get the Canon EOS Rebel T7i/800D or the EOS M5? Should I Get the Canon EOS M50 or the EOS Rebel SL2/200D? Want great image quality but don't want to carry around a full-sized DSLR? Canon's EOS M50 and EOS Rebel SL2/200D are two options you may have been considering. If so, let's take a look at these two cameras to see how they compare. Those wanting the smallest and lightest camera option, especially for backpacking or family vacations, Canon's mirrorless cameras pack DSLR-level image quality in a take-anywhere size. That the EOS M50 is compatible with Canon's similarly-small EF-M series lenses further bolsters this advantage. And while the M50 is technically more versatile from a lens options standpoint when the EF-EOS M Adapter is factored into the equation, use of the adapter with designed-for-DSLR lenses negates much of the small size and light weight benefits of an M50-based kit. If you need a camera that shoots 4K, then the choice is easy – the EOS M50 shoots 4k, the EOS Rebel SL2/200D does not. Although you don't get the benefits of Dual Pixel CMOS Movie Servo AF in 4K mode, the ability to shoot 4K combined with the M50's vari-angle LCD and small size/weight will make it an extremely useful tool for filmmaking, especially for vloggers or one-man crews. If you appreciate the benefits of an EVF (Electronic Viewfinder), then the EOS M50 becomes the de facto option. However, note that I didn't list an EVF as a benefit for the EOS M50 nor did I list the OVF (Optical Viewfinder) as a benefit for the Rebel SL2/200D. Your own personal preferences and specific needs will dictate which viewfinder is most advantageous. Check out our article "Comparing Electronic Viewfinders to Optical Viewfinders" for more information. The EOS M50 also features a better/more sensitive AF system, more sensitive metering system, a faster continuous shooting burst rate and a larger buffer. These features along with the camera's new .CR3 RAW file format (with space saving C-RAW support) result in an overall more versatile camera compared to the EOS Rebel SL2/200D. Who should opt for the Canon EOS Rebel SL2/200D? For those who tend to occasionally forget to pack important items in their gear bag, an advantage of the SL2/200D is its native compatibility with all of Canon's EF, EF-S, TS-E and MP-E lenses (no adapter required). Those needing to control larger lenses on their camera and those actively using the camera for substantial time periods will appreciate the SL2/200D's more substantial grip and longer battery life. The Rebel SL2/200D's larger exposure compensation range can certainly come in handy under extreme exposure conditions. The Rebel SL2 has one particular advantage that nearly every photographer can appreciate – a lower price tag compared to the M50. Permalink: Should I Get the Canon EOS M50 or the EOS Rebel SL2/200D?